The purpose of any product or service is to solve a problem – and no matter the problem, being the first to come up with a solution always gives you an advantage over the competition. You have the unique opportunity to test it out, gather and analyze customer feedback, and modify the solution to improve its effectiveness. People who copy your ideas will always be one step behind. When it comes to educational software, SMART Learning Suite has that same advantage. When interactive displays first emerged on the market, SMART realized that educators needed some type of lesson creation tool specific to this new technology. They were the first company to come up with a solution for this need when they released SMART Notebook, a software specifically designed for educators to create and present engaging lessons on interactive displays. What Makes SMART Learning Suite the Best-in-Class? Since SMART Notebook was released, many companies have tried to replicate that success by releasing their own software similar to SMART’s. However, as the forerunner, SMART has always been able to stay ahead of the competition by constantly adapting SMART Notebook to better meet the needs of educators. Today, that solution is a software suite called SMART Learning Suite (SLS). It’s a robust collaboration-centric tool that features game-based learning components, formative assessment tools, and seamless integration with personal devices. When we compare the features of SLS to other educational software on the market – such as Quizdom’s Oktopus Software – we clearly see how the product lags behind SMART’s. Oktopus is a subscription-based interactive presentation and collaboration software – also designed for use with interactive displays. 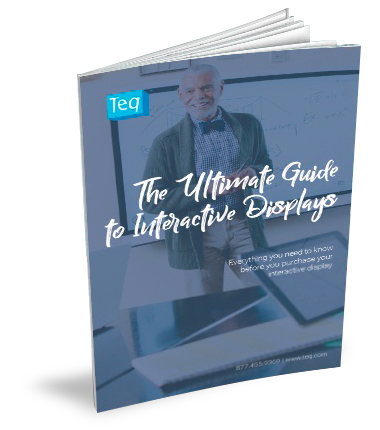 It is currently the software of choice for a few interactive displays on the market including ViewSonic and TouchIT boards. While it sounds like both software provide similar features and functionality, if we dig deeper, we clearly see that SLS is the stronger and more feature-rich solution. Below, we provide a comparison of the two. While SLS and Oktopus both promote real-time collaboration from student devices, SMART Learning Suite provides more collaboration tools and functionality for a wider-range of different devices. An SLS subscription comes with access to SMART Learning Online (SLSO), a cloud-based platform that allows educators to share Notebook lessons, including lab and response 2 activities, as well as other imported content, to student devices. Since the platform is web-based, students have the ability to access content from any device, including Chromebooks. While Oktopus provides some of these features, it is missing some important collaboration features, and lacks some of the functionality provided by SMART Learning Suite Online. For instance, Oktopus does not provide collaborative student workspaces. Not having this feature makes it difficult for student or group collaboration to occur while leveraging student devices. Oktopus software allows for the use of game-based learning activities and formative assessment, but their activities are not customizable, limiting their applications to only a few subjects and basic skills. In addition, their formative assessment tools do not allow you to create different question sets or save question lists (you can only save results to questions individually), meaning a teacher will have to ask questions one at a time and cannot save them to be used later. In contrast, SMART Response also allows teachers to export results of the assessment to an Excel spreadsheet, or to existing gradebooks, and allows students to respond to questions from any device. For any type of collaboration to occur using Oktopus software, customers must use the Qwizdom Notes+ app. Whether it’s joining live presentations or completing game-based learning activities and formative assessments, students must download and use the app to join in with the teacher’s session. However, Qwizdom notes is not a free app, and an Oktopus software license only comes with five licenses to it, meaning you will have to purchase an annual upgrade key to enable all of your students to collaborate using the software. Last, but definitely not least, Oktopus software or the Qwizdom app are not available to download on Chrome devices, so students will not be able to use their Chromebooks to access or collaborate in the software. Desktop annotation is the ability to write with digital ink over your desktop or applications, most of the time while using it in conjunction with an interactive display. It allows you to work collaboratively on documents or draw attention to a specific item being displayed. With SMART, you can take desktop annotation one step further by actually inking into a variety of different applications. Inking into applications means that you have the ability to edit content in these programs while working in the software. These applications include Microsoft Word, Excel, and Powerpoint, as well as PDFs, Google Earth, iMovie, and more. In addition, SMART allows you to ink directly into a web browser, and write on multiple tabs of the browser, so you will not have to erase your annotations every time you switch between tabs. Having the ability to directly ink into any application or web browser from the software creates a seamless experience across all devices for teachers and students. While Oktopus software offers the ability to write over applications in digital ink, it does not provide the ability to ink directly into any applications or on a web browser. This is because Oktopus uses a feature they call “glass mode” to enable desktop annotation. Glass mode allows you to take a snapshot of your file, and then annotate over the snapshot, essentially creating an overlay. For example, if I am using glass mode on a Powerpoint presentation and wish to annotate on a few of my slides, I would have to enable glass mode in the Oktopus software, navigate to my presentation, take a screenshot, and then annotate. If I wish to annotate over another slide in the presentation, I would have to exit overlay mode, and start the process all over again. This becomes frustrating for teachers when trying to deliver a lesson, and wastes valuable classroom time. In terms of inking into different applications, Oktopus allow users to type into different applications using a native keyboard – which is a very different and less intuitive than SMART’s experience, where the user draws or writes directly into the application. While both Oktopus and SMART Notebook both contain many of the same types of features, the SMART Notebook tool library provides a wider range of tools for educators to create more engaging lessons. For example, while both software feature pen types such as a highlighter, shape, and text pen, Notebook has a few additional pen types including a magic pen, creative pen ,and calligraphic pen. Having more pen types available allows educators to better draw attention to specific content while presenting or collaborating in the software. In addition, while both include access to a gallery providing a variety of different images, backgrounds, and themes, Notebook’s gallery also includes access to different types of interactive and multi-media to better encourage student collaboration and engagement with the lesson. In addition, Oktopus Software does not contain some of the tools included with Notebook. For example, Oktopus is missing some commonly used math tools found in Notebook, including SMART Blocks (interactive math blocks), Ink to Equation (recognizes any equation written in digital ink), and the Equation Solver Tool (allows an equation to be simplified both symbolically and numerically). It is also missing some other commonly used features including Infinite Cloner (create infinite copies of an object by dragging from image), and interactive tools such as concept mapping. SMART Learning Suite: A single license for SMART Learning Suite costs $49 or less per teacher a year (depending on quantity purchased). This includes access to all of the features discussed in this post, including access to SLSO, lesson creation tools, game-based learning activities, formative assessment, and collaborative student workspaces. If you’d like to delve more into the comparison between SMART Learning Suite and Oktopus, check out our full feature comparison chart. Use the form below to download the FREE ebook and value rubric.